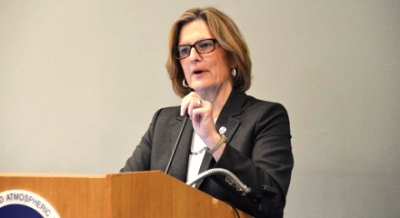 President Obama formally nominated Kathryn Sullivan to be the next administrator of the National Oceanic and Atmospheric Administration (NOAA) on Thursday. Sullivan, a former astronaut who was the first U.S. woman to walk in space, has been acting NOAA administrator since Jane Lubchenco stepped down in February. Kathryn Sullivan, the nominee for NOAA administrator. If confirmed by the Senate, Sullivan would be only the second woman to serve in the position since the agency's creation in 1970. NOAA, with an annual budget of about $5.4 billion, has a broad portfolio ranging from climate research and weather forecasting to fisheries regulation. The agency, which is part of the Department of Commerce, is also home to the government's smallest uniformed service, known as the NOAA Corps, which operates the agency's fleet of research ships and aircraft. Sullivan's confirmation would her give the reins at a difficult time for NOAA, facing mandatory budget cuts due to the so-called sequester, as well as a likely gap in weather satellite coverage that could erode the country’s ability to anticipate extreme weather events more than a few days in advance. Budget cuts have already strained the resources of the National Weather Service (NWS), in particular, with numerous offices operating well below full staffing levels as the nation heads into the heart of hurricane season. Sullivan was forced to cut funding for a joint U.S.-Taiwan satellite program in order to avoid furloughing NWS employees. 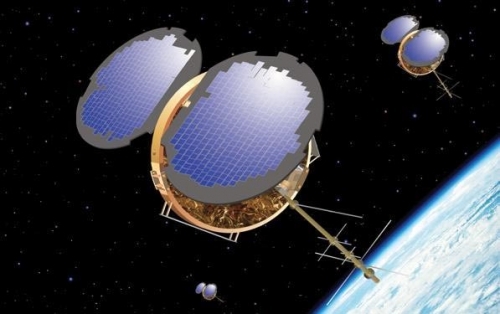 That satellite program, known as COSMIC-2, is itself aimed at improving weather forecasting. Sullivan will also have to contend with congressional efforts to redistribute NOAA’s research funding to favor weather forecasting applications, while cutting funding for climate science. The agency opposed an early version of a House bill that would prioritize weather research over climate spending on the grounds that it would hinder the agency’s ability to better prepare the nation for weather and climate extremes. Since 2011, Sullivan has held the position of assistant Commerce secretary for observations and predictions. She previously served as the director of the Battelle Center for Mathematics and Science Education Policy in the John Glenn School of Public Affairs at Ohio State University, and president and CEO of Ohio’s Center of Science and Industry (COSI) from 1996 to 2005. She has also served as NOAA’s chief scientist, and was one of the first six women selected to join the NASA astronaut corps in 1978. She flew on three shuttle missions, including the mission that deployed the Hubble Space Telescope. Sullivan was born in New Jersey and attended the University of California at Santa Cruz. She earned her doctorate in geology from Dalhousie University in Canada in 1978. NOAA's placement under the Department of Commerce is part of a bureaucratic arrangement that dates back to a dispute that took place at the time of its creation in 1970, during the Nixon Administration. At the time, President Nixon was embroiled in a dispute with then-Interior Secretary Wally Hickel over the Vietnam War. Hickel was supposed to add NOAA to his portfolio at Interior, but as retribution, Nixon decided to place the agency elsewhere. President Obama has proposed moving the agency to Interior, although that proposal has not gained traction on Capitol Hill. In his 2011 State of the Union Address, Obama poked fun at the bureaucratic divisions between Interior and Commerce. “The Interior Department is in charge of salmon while they’re in fresh water, but the Commerce Department handles them when they’re in saltwater. I hear it gets even more complicated once they’re smoked,” Obama said. Editor's Note: An earlier version of this story stated that Kathryn Sullivan was the first woman to walk in space. In fact, that honor belongs to Svetlana Savitskaya of the former Soviet Union. Sullivan was the first American woman to walk in space.